MIDDLEBURY, Ind. 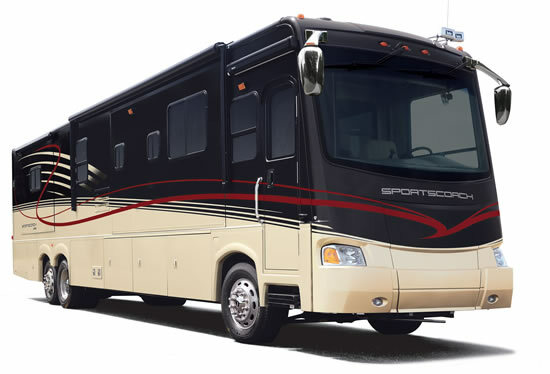 Aug. 2008 — Superlatives are not enough when it comes to describing the new Sportscoach® Legend™ motorhome. Sportscoach is redefining the concepts of spaciousness and luxury with this next generation coach. The Sportscoach Legend has four space-expanding slideouts and is 44 feet, 10 inches long. This spaciousness is made possible by the tag axle chassis that is the foundation of the Legend. A tag axle is a second rear axle that allows a longer coach with more weight capacity. Sportscoach turned to Freightliner® and its Powerliner Chassis III for the platform. The Powerliner has a 10.8L ISM Cummins® engine that delivers 500 horsepower and 1,550 lb.-ft. of torque. That is plenty of power for any driving situation. The six-speed Allison 4000MH automatic transmission smoothly transfers power from the engine to the wheels, and the ZF™ Independent Front Suspension with an exceptional 60-degree wheel cut makes this coach extremely maneuverable. Freightliner also incorporated its industry-first "automatic load proportioning" system that electronically allocates weight distribution across all three axles for a smooth, comfortable ride. Sensors adjust the ride height and air pressure in the suspension for each axle to balance the load. For convenience, the Legend has a magnificent 198 cubic feet of exterior pass-through basement storage. 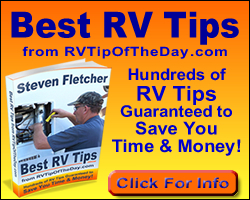 That is almost double what other diesel motorhomes offer. Aluminum side swing compartment doors make accessing that storage easy. Besides its larger size, the Legend also sports awesome looks. Designers gave the Legend two full-body paint options — Midnight Desert and Midnight Burgundy. The front and rear fiberglass caps are gracefully curved to give the Legend a distinctive look and to make them more aerodynamic. The curved look is continued inside the coach where designers employed the avant-garde styling popular in the marine industry. The Brazilian Cherry cabinetry and contoured contertops are curved to give the interior a sensuous, eye-catching look. Halogen lighting in the soft-touch vinyl ceiling adds to the appeal. Two of the Legend's four slideouts are in the living area to accommodate dual sofas. The sleeper sofa is integrated with the dinette in such a way that the back of one dinette bench is the arm of the sofa. Designer ceramic tile that is easy to maintain and clean paves the flooring from the entry to the rear bedroom. In the kitchen, the Legend has a 12-cubic-foot side-by-side refrigerator, three-burner cook top and 30-inch convection microwave oven. And, throughout the living and dining areas are overhead cabinets offering fantastic storage. Pocket doors separate the bathroom from the kitchen. Sportscoach designers selected dual designer vessel sinks for the bath, as well as a shower enclosure with rain glass textured shower door and an overhead skylight. Step into the bedroom where a king bed is standard with nightstands on each side. Two slideouts add to the roominess. Across from the bed are a bench seat and more storage and closet space. A washer-dryer combo is optional. Sportscoach’s all-new Legend definitely will make a name for itself in realm of luxury and spaciousness. And, what's best of all is that this coach comes well equipped with an MSRP around $300,000.